In the early days of my blog, I posted a broad summary of my layout design and goals, including the source of my track plan for the town of Ballard (see that post at: http://modelingthesp.blogspot.com/2011/01/layout-design-ballard.html ). I designed that track arrangement as a modificativon of a published town plan, West Agony on Terry Walsh’s West Agony & Inchoate Railroad. 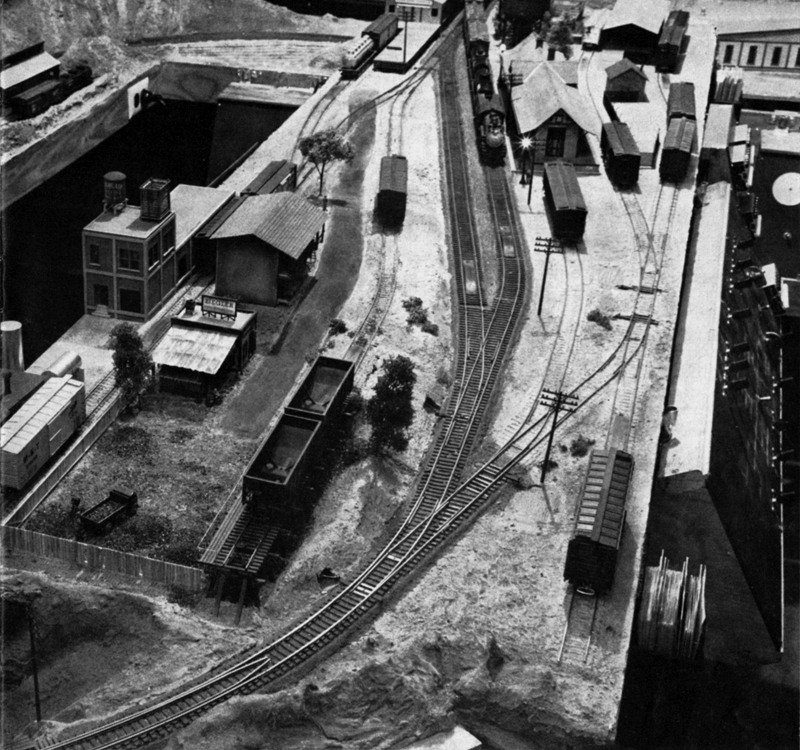 The plan, and a switching problem to illustrate its complexity, was published in Model Railroader magazine (“Problem at West Agony,” Model Railroader, Vol. 27, July 1960, pp. 22–25). I chose it because I intended that my town of Ballard would be a switching-intense location. Recently I had a question about this town plan, and thinking about it made me pull out that old MR article and re-read it. It really took me back, to when I intensely studied how this town worked and how it might be switched. The excessively whimsical industry names did not charm me, but the author stated they were intended partly to serve as mnemonic reminders for train crews for which industry did what. Terry Walsh’s town was laid out in a space 2 feet by 7 feet. I was able to go further and utilize a 34 inch by 8 foot piece of plywood. But largely my plan follows Terry’s pretty faithfully. Though schematic, the map below (from the timetable used by my visiting operators) shows haw similar the overall plan is. This schematic is compressed horizontally, and my actual shape is more like the shape you see in Terry’s map, above. 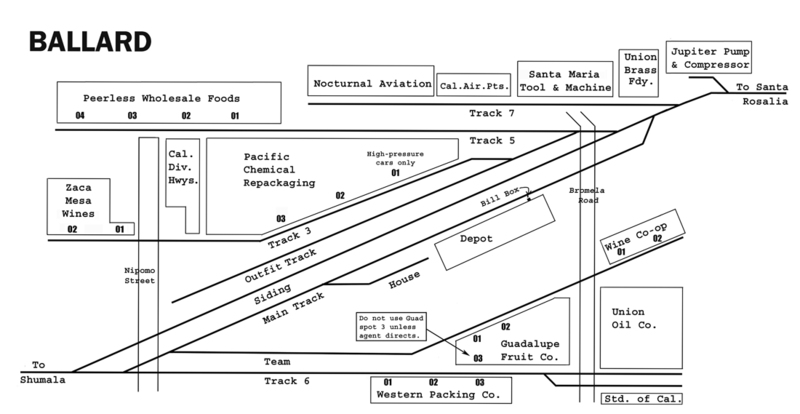 The main thing I omitted was the switchback tracks to industries in the corners, a feature I try to avoid. 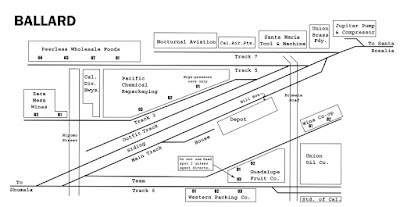 All my industry names are included in the map for anyone interested. I do manage to include 15 industry spots, where Terry had nine, with my long back track and greater town width. I especially like the long “double” track across the diagonal, giving both a run-around and space to switch. Another feature is that everything on either side of the double track can be switched from one end. Operators often use this to their advantage for efficient switching. Photos show also how similar the towns were. Here is the view of West Agony as it appeared in the magazine (Terry Walsh photo), obviously taken from the west end of town (see map). This town was accessible on both sides. My own town of Ballard from a similar perspective looks like this (coincidentally also from the railroad west end of town). One side of my town has a backdrop along it. 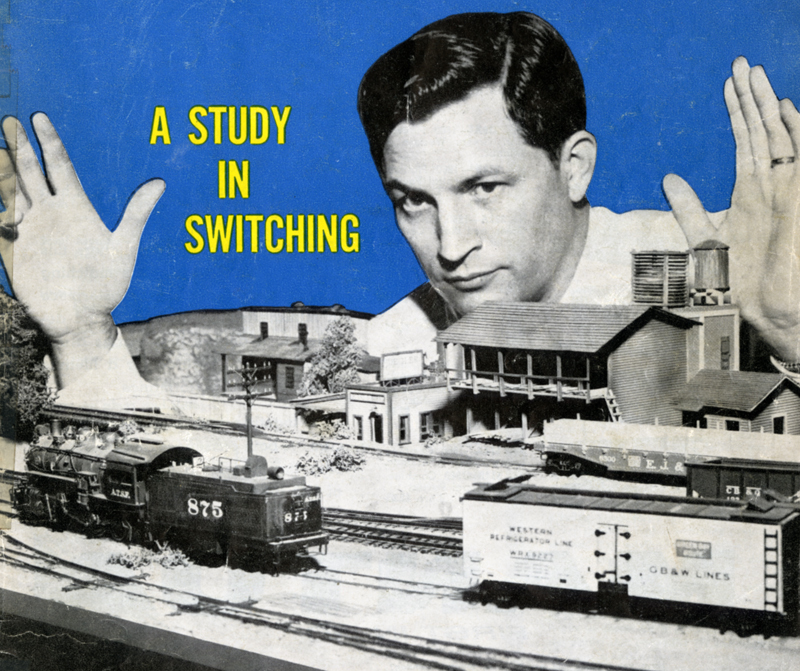 Finally, although most layout articles in magazines include no photo of the modeler, or only a small portrait view, in this instance the magazine cover featured Terry himself, photographed with West Agony in the foreground. 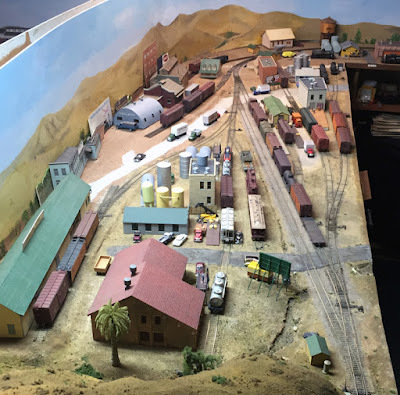 Terry was one of the fine Dallas, Texas area modelers inspired by and mentored by Cliff Robinson, and probably deserves more recognition than he has gotten. I regret I never met him. Here is part of that cover. It was fun, years ago, to dream of someday having a layout town something like West Agony, the switching of which I had, in imagination, spent lots of hours doing. Then came the fun of actually building such a town, my layout’s Ballard. Now it’s just as much fun to be able to switch that town, whether doing so myself or watching visiting operators do so, and thus bring it to life as I had wanted to do. Thanks again for the ideas, Terry Walsh. Wow! . . . a trip down memory lane. I too built a version of this town back in the 1970s. I had it in a small bedroom with a simple mainline extension off of each end so that I could bring a train into and out of the town. I still love that plan. It has sure worked for me. When I get compliments, though, I always credit Terry Walsh.